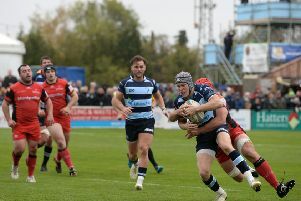 Bedford Blues ended their losing run in the Greene King IPA Championship when they beat a resilient Moseley team 31-21 at a sunny Goldington Road on Saturday afternoon. A brace of tries from Jake Sharp, as well as scores from Nick Fenton-Wells, Camilo Parilli-Ocampo and Pat Tapley secured a bonus point victory that ensures the Blues faithful will be watching Championship rugby next season. Bedford and Moseley were 10th and 11th respectively heading into the clash, but the five point win lifts the Blues up to ninth above Doncaster, whom they travel to next week. The visitors were on the front foot immediately as they looked to play territory in what were blustery conditions at Bedford’s home. Two Will Hooley penalties inside the opening 12 minutes gave the visitors a 6-0 lead as the fly-half, who is dual-registered with Northampton Saints, punished ill-discipline from the Bedford defence for giving away penalties within striking distance. A third Hooley strike from the tee secured a nine point lead after half an hour, but that seemed to galvanise Mike Rayer’s side in to life and they were the first team to score a five pointer just three minutes later. With the Blues first attack of the match, a strong couple of breaks by Fenton-Wells and Michael Le Bourgeois created quick ball in the Moseley 22. As the defence struggled to organise themselves at the quick tempo of the play, fly-half Sharp spotted a huge gap in midfield and gleefully put his head down to sprint over the try line to score the opening try of the match. James Pritchard sliced the posts from the conversion, and Bedford would have been satisfied to only be two points behind their opponents going into the break. However, what has been a constant theme for the Blues throughout the season; they received a yellow card just before the break when Josh Buggea was pinged for not rolling away from a ruck. Hooley was unable to maintain his 100 per cent success rate from the resulting kick, and so Moseley entered the interval leading by just two points in what was a scrappy opening 40. Yet the lack of incident in the first half was made up for in the second, as both teams looked to play expansively in the Bedfordshire sun. Firstly, Sharp supplied a delicate chip and chase that he collected himself to get behind the gain line. Skipper Fenton-Wells was on hand to perform a simple scissor move that allowed the South African to trundle his way over and send Bedford into the lead for the first time. Moseley were only behind for a couple of minutes though as they scored their first try of the afternoon through Ben Nutley. The back-row forward pounced on a loose ball on half way after Viliami Hakalo knocked on, and the openside flanker sprinted half the length of the pitch to send them back into the lead, 16-14. It got bad to worse for Bedford as some weak tackling allowed Will Owen to score in the left corner and stretch their lead to seven points. Both teams began to make changes as the tempo remained high in a match that was so vital to both teams fortunes, and it was a Blues replacement who was on hand to make the biggest impact of all, drawing the scores level via a try. Prop Parilli-Ocampo stretched over from close range just to the right of the posts to score his first try for the club and in the process tie the scores at 21 apiece after Pritchard’s conversion. It wouldn’t be a try fest without Tapley getting himself on the scoresheet, as the winger scored a superb individual effort on the hour that secured the four try bonus point. He tenaciously forced his way through tackles before side stepping Moseley’s Mike Penn with style to score in the right corner and delight those in attendance supporting the home side. The Blues definitely turned on the style after the break, and Kevin Maggs’ side, who have now lost their six matches in the league, were desperate in their search of scoring a vital third try. Drew Cheshire thought he did just that when he was mauled over the line, but the home defence managed to hold him up before winning a penalty from the resulting five metre scrum. That was as close as they got to regaining the lead, and instead they were unable to claim a losing bonus point from their afternoons efforts as Sharp scored his second try of the afternoon with the last play of the game. The former Saracens player pounced on a loose ball before supplying the icing on the Blues cake with a score in the corner via a joyful dive. Pritchard couldn’t convert, but it didn’t matter as Bedford had already won 31-21 and finally gave their fans something to cheer, as they now head into their final two matches of the campaign with a ‘W’ next to their last result. Bedford: Tom Williams (Camilo Parilli-Ocampo 53), Charlie Clare (TJ Harris 72), Phil Boulton (James Currie 53), Paul Tupai (Hayden Thompson-Stringer 71), Harry Wells (Mike Howard 55), Justin Blanchet, Josh Buggea, Nick Fenton-Wells (c); Luke Baldwin (Darryl Veenendaal 59), Jake Sharp, Henry Staff, Viliami Hakalo (Baden Kerr 47), Mike Le Bourgeois, Pat Tapley, James Pritchard. T: Jake Sharp x2, Nick Fenton-Wells, Camilo Parilli-Ocampo, Pat Tapley. C: James Pritchard x3. Moseley: Craig Voisey (Nathan Williams 56), Adam Caves, Simon Gardiner, Mike Powell (c), Greg Charlton (Nile Dacres 67), Buster Lawrence (Ed Siggery 25), Ben Nutley, Chris Brightwell; Sam Brown (Alex Day 63), Will Hooley, Josh Skelcey (Sam Olver 53), Anthony Carter, Will Owen, Drew Cheshire, Mike Penn. Replacements not used: Harry Hone, Scott Tolmie. T: Ben Nutley, Will Owen. C: Will Hooley. P: Will Hooley x3. Assistant Referees: David Proctor and Richard Kelly.